This past weekend I went to pick up the bike from my boss/friend's house. He had been holding it there since the weekend before when I left it after his party. Well, rather than just coming and getting the bike, we decided that we would all go for a ride. Me on the 72 Yammy, Michelle (Brian's finacee) on her newly-acquired 72 Honda 350, and Brian and Kendra on the his first bike, a Yamaha cruiser-type. The Triumph is still in the shop over at Hiway. The plan was simple... Michelle had to drop something off at her parents' house in Plumsteadville. After getting to Brian's house in Abington, we would all ride out first to Russ' house, possibly recruiting him, and then on to the parent's house, and back. We got to Russ's house, and after a few minutes he arrived and we persuaded him to go for a short ride. He pulled out his caffeinated Yamaha, and we were off... on the way there, Michelle's mirror glass liberated itself from the mirrorpost and went sailing through the air. We got to Michelle's parent's house, marveled at Norman (a bat who had taken up residence behind a wooden sign on the outside wall), had a Coke and a smile and were off again. This time to Van Sant airport for a little glider-watching. Just as we pulled in a orange glider landed silently on the grass runway... after a few minutes of poking around, looking at the old open-cockpit trainers and such, and watching another glider go up, we were headed out again, this time down to Dilly's for some eats. Even though it is August, the weekend was surprisingly chilly. I had two shirts on plus the jacket and was slightly shivering. Going in and out of the tree shadows really had a big impact on comfort. The sun was setting when we approached Dilly's. We pulled in, to a small crowd of children's amazement. Russ departed, heading back to his projects at the house. We ordered a whole trayful of greasy goodness, scarfed it down, remounted and pulled away past a bunch of Victory riders. Cool. Speaking of hands, boy mine were sore. That clutch is not an easy thing to keep squeezing for six hours. Eventually we got back to Brian's, where Kendra dismounted and got back into her car for the long ride home. All said and done, the trip was about 7 hours and 140 miles. Not too shabby. The bike was great, except for that constant-speed bucking thing, which I've learned to keep under control with clutch usage. The bike was even smoking a lot less by the end of the day. Felt a lot more confident, especially in slower traffic. Among the other bikes I've owned, my R5 was one of the favorites. There were only a couple of things that turned out to be crucial, the first being don't try to make it do something it does not want to do. Mine would shake its head one time and lay right down on my left knee. Happily, they are not heavy beasties, and pick up relatively easily, although I should tell you that it's been more than 30 years since I had to pick it up. If it smokes too much, odds are the oil mix pump needs adjusting - but don''t adjust it yourself to a no-smoke point - that could be followed shortly by a no-run point, and a large bill. It should smoke just a little at hard throttle. They are good runners, although you're right in that they seem to hate a stead speed - but after all, it is a small Yamaha, and they're custom made for canyon racing, or for running up into Bucks County on some of the older roads. 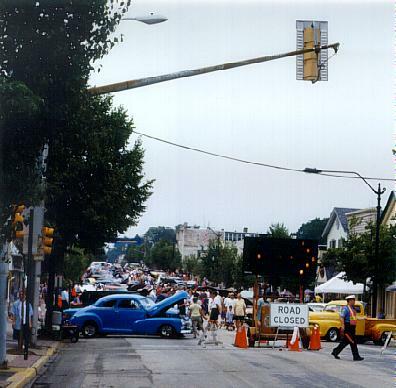 I'm a Hatboro class of 1960 graduate, so I know Street Road fairly well - you'd've been happier on a two-lane that was interesting - the four-lanes are best run with something larger and less intense. The R5, when everything is just right, will run like stink, and embarrass many a larger bike, both at a light and back through the boonies. Mine spent a lot of time in the New Hope area, which was loaded with good practice roads. Enjoy it - it is a fine machine, and should serve you well for years with minimal upkeep - just read the manual and do what it says. Since it is the predecessor to the RD-350, the quintessential hooligan bike, you can do darn near anything to it racy. I had ridden the bike out to the Hatboro Car Show. The morning was spent wrenching with Kendra, adjusting the cafe bars and mirrors and replacing the oil tank side cover, whose original paint had flaked off. A good cleaning made her look great. Brass brushes work wonders on rusty chrome! Arrived at the car show, left when it got crazy crowded. Afterparty was at Brian Isserman's, and after a few drinks and facing the long ride home in the dark I decided it best to park the bike and leave it there. Good thing, as the corner of our street flooded with 4 or more feet of water. Had the bike been chained where in it's usual spot, it would have been lost.